The view is across the Stratford-upon-Avon canal (marked by the poplar plantation) towards the higher ground north of Preston Bagot. 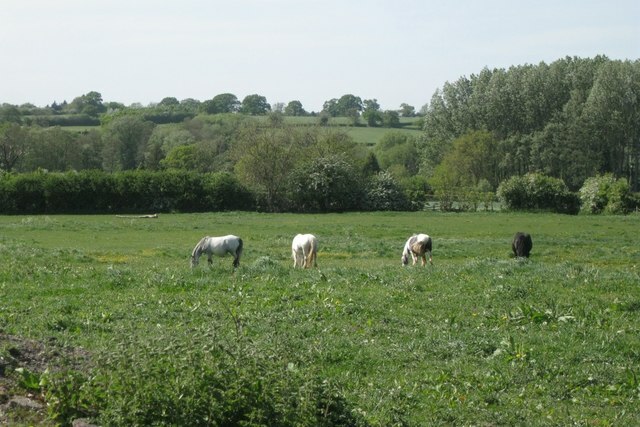 “Ancient Arden is the most extensive Arden landscape and forms the core of ancient countryside in Warwickshire. It is a small-scale, intricate landscape with many low rounded hills, steep scarps and small incised valleys. Landform is rarely dominant but in places is emphasised by hilltop woodlands and wooded scarps… Characteristic features include: a varied undulating topography; many winding brooks and small rivers; a close network of winding lanes, tracks and paths, often confined by tall hedgebanks; an ancient irregular pattern of small to medium-sized fields; hedgerow and roadside oaks and small woodlands, resulting in short views and a sense of enclosure; field ponds associated with permanent pasture; dispersed settlement: hamlets centred on farms; wayside cottages; few villages; and many place names ending in Green or End. “The region known as Arden is an area of former wood pasture and ancient farmlands lying [mainly] on the eastern side of the Birmingham plateau.” Roughly speaking it is bounded by the rivers Tame and Anker in the north and the Warwickshire Avon in the south, although Arden-type landscapes extend into northeast Worcestershire and the former West Midlands county. “Although there are few dramatic physical features, the Arden countryside has an intimate, historic character with a strong sense of unity. Brick and timber are the chief building materials throughout the area [in the countryside, not the urban intrusions] and the many farmsteads and hamlets blend subtly with their surroundings. This is Shakespeare’s ‘Forest of Arden’, historically a region of woodlands and ‘waste’ which remains today [in 1993] one of the more wooded parts of the Midlands. Even where enclosure, emparkment, industry, transport, mining, suburban and other development have taken place the original character may still be felt. Place names ending in Heath and Common, as well as Green and End, occur throughout the suburbs of Birmingham, Coventry, Solihull and Redditch, and are a reminder of Arden's original extent. More recent urban and suburban landscapes are enriched by the ancient oaks and hollies, timber-framed houses and fragments of woodland and pasture that survive in their midst. Extracts in double quotes are from ‘Warwickshire Landscapes Guidelines: Arden’, Warwickshire County Council, 1993.